A painter Akash in his early days sees a lot of struggle. His life revolves around only two people, Pran and Suma. Somehow the puzzle of his life starts solving. Zenobia is a famous name in the industry. She is a known Page 3 personality. But this obsession of being in the light can be contagious sometimes. What role these people play in each other’s lives? What impact the difficulties make? How the things sort and how they mingle? 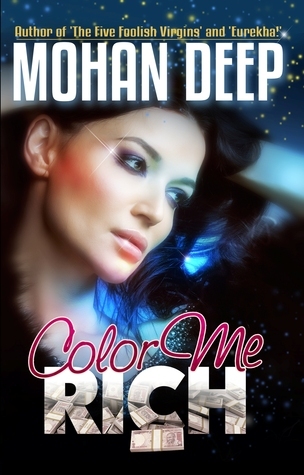 Color me Rich is an apt title for the book. The atrocities of present time can always excite the want of materialistic wants. No one can be blamed, that’s how the world works. It was interesting to see how the title fits in the picture. Extra points for such pick by the author. It’s always appreciable to have a title which is not a phrase from the book but is something more meaningful. The glittering cover shows the extravaganza that is going to cast its spell on the reader. But was it equally artistic and intelligent as the title? Umm, it’s a dilemmatic question. There are two perceptions in my mind about that. Could there be an alternative? Yes. There were not vast number of characters. I couldn’t distinguish two completely opposite characters. Every person had some traits which were likeable and unlikeable. So, I definitely missed a strong antagonist in the story. But apart from that the people in the spotlight held the story well. There were vivid relations in between the characters, making it a complete package of emotions. No character was overpowered or overshadowed. There was an efficiently maintained equilibrium. Apart from all, the characters worth remembering are: Pran, for his excellent companionship, Suma, for her simplicity and Zenobia for her love. A supporting character also deserves a mention here- Bollywood Aunty, for her soft heart. The narration being in third person worked fine for the book. If there were no loop holes then there were also no extra-ordinary jerks. But simplicity is not bad after all. The narration and negligible errors made the reading experience serene. No hitches, no breaks. The switches in scenes were clear and thus there was no confusion because of that. The perfect blend of “Yesterday” and “Today” allow you to peep in the past and present without forgetting the hardships and any such important incident. Color me rich is promising from the very start. The way the story opens is quite relaxing and hurtful. The dark side is revealed first and a novel opening with a shadow, always catches attention. Akash shows the real face of our youth, shining in the backstage due to unavailable assets. The incidents cross your vision quite hurriedly. It could have been a little under control. The starting takes off in fourth gear but the middle is rather bleak. There was a total change of mood in the next few chapters. The darker shadow was shown some light but it didn’t work quite well. More suspense and newness was required, just like the start. It lacked the emotional/mental connection. There were no butterflies flying in the stomach and no queries in mind. However, the trend changed when the end was approaching. The regular reading is interrupted by some scintillating turns. What is expected from a book? Some lessons and memories that remain in the brain with the name of the book. The end had that strength in it. You are taken aback in a jiffy. And your mouth curls up in a sense of shock. It was a relief to read something of that order. Color me Rich had enough places that needed double reading to know the real sense behind it. Though it was a quick read but still it had troughs and crests. The story was a perfect blend of emotions, desires and psychological advancements. The writing of Mohan sir was simple and to the point which enhances the beauty of the book. His hard work in making a spicy story can be seen throughout. All in all, a worthy read. The simplicity of the book was the big turn on. It made it a quick read. There was no hard vocabulary to stop you. The focus was only on story. No attempt the author made to shift one’s attention. The book showed the dark side of an industry, the hardships and the trump card required to move ahead in the world. The major issue with the book was in its super fast movement. The story shows one part and then suddenly scene changes. It became hard to indulge completely in one scene. There was a need of more emotions. At some places things hurried, where there was a need of a long dive, the curtains dropped quickly. That’s the only drawback of the book. Eager to know the reality checks of art industries? Color me rich can be a nice pick in terms of drama and a high profile story.